Japan is the global leader in the market development of cryptocurrencies — a global buzzword recently — some of which have seen their values skyrocket over the past year. As of Jan. 15, yen accounts for 56.2 percent of bitcoin, or BTC, the most popular cryptocurrency, according to coinhills.com. Yen is followed by U.S. dollars at 28.4 percent, while all others account for 15.4 percent. Chinese yuan used to account for the largest until January 2017, but dropped after the state imposed strict restrictions on cryptocurrency trading. At this time, no statistics are available to show the yen’s dominance across all types of cryptocurrencies. BTC, accounted for 32.8 percent of the market capitalization of all cryptocurrencies as of Jan. 15, making BTC the largest of at least 1,000 existing cryptocurrencies, according to coinmarketcap.com. Japan’s No. 1 position is owed to a solid legal system supporting the industry to build credibility among individual investors, as well as Japanese familiarity with securities trading, said Midori Kanemitsu, the chief financial officer of Japan’s largest cryptocurrency exchange operator, bitFlyer Inc.
New York state has created the “BitLicense” to regulate cryptocurrency exchanges, but “the restrictions are too strict” and “it’s effectively not working” as well as the law in Japan, she said, adding that there are only four companies awarded BitLicense and bitFlyer’s subsidiary in the U.S. is one of them. According to the Financial Services Agency, Japan had 16 companies operating cryptocurrency exchanges as of Dec. 26. Yuzo Kano, bitFlyer co-founder and CEO, has worked hard to persuade lawmakers to legalize cryptocurrency trading, Kanemitsu said. Mt. Gox’s 2014 bankruptcy prompted the industry to impose voluntary restrictions. As these restrictions were not effective, Kano began working with lawmakers to legalize cryptocurrency trading, Kanemitsu said. The law was enacted in May 2016, and went into force in April. Another reason that Japan is a driving force for cryptocurrency market development, is that Japanese are familiar with day trading, particularly on foreign exchanges. “Japanese are the largest foreign exchange investors as well. I guess that Japanese like speculative investments,” Kanemitsu said. Cryptocurrencies have become a major financial product that can be alternatives to stocks, foreign exchanges and bonds. BTC’s market capitalization was $230 billion as of Jan. 15, compared with Toyota Motor Corp.’s $225.7 billion, Japan’s largest stock. The market capitalization of all cryptocurrencies was $701 billion. Kanemitsu and Maki Yoshisuji, a Coincheck Inc. spokesperson, said BTC, which emerged from a thesis written by a person under the pseudonym Satoshi Nakamoto, will continue to be the most popular cryptocurrency because it is the oldest cryptocurrency and is considered the most stable because it has never gone through changes in specification. “It’s not convenient for users if the benchmark cryptocurrency changes too much,” Kanemitsu said. However, there is a risk of BTC losing popularity if transaction fees continue to be high. Users have to pay transaction fees when they transfer cryptocurrency from one place to another. Popularity means more transactions, leading to higher transaction fees. The average fee for BTC transactions was about $26 on Jan. 16. This means that those who make an online BTC donation of $1 would end up spending $27. The fees do not change regardless of transaction volume. 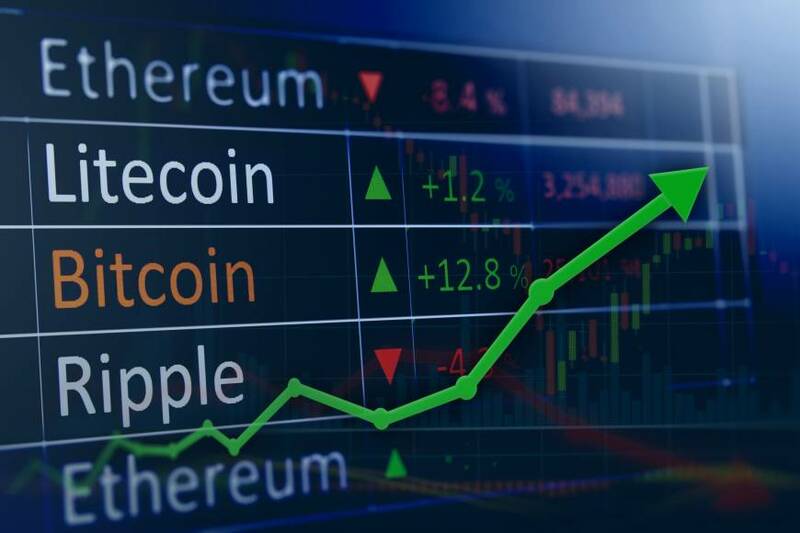 The corresponding figures for ethereum and ripple, the second and third-largest cryptocurrencies in terms of market capitalization as of Jan. 16, were about $2.3 and $0.012 respectively. A key to reducing transaction fees and remaining popular would be technological innovation. Currently, BTC is technologically designed to be able to handle about seven transactions per second. The fees would be lower if the number of transactions per second increases. In addition to BTC, other cryptocurrencies also have limits on the number of transactions a second. “Engineers globally are working on increasing the number of transactions for different types of cryptocurrencies,” Kanemitsu said, adding that one technology genius can potentially make any one cryptocurrency very popular overnight. Kanemitsu and Yoshisuji said cryptocurrency is a great invention to change the way people live. It does not require banks to transact, allowing transactions to happen at a relatively low cost. Travelers, as well as those who want to send money to their family members living overseas, can benefit from using cryptocurrencies. “Japanese like such innovation. We like using it and developing it. I want Japan to send the world a message on how fascinating cryptocurrency is,” Yoshisuji said. Whether the current hype for cryptocurrencies is justified or not will rest on demand for practical uses of cryptocurrencies. 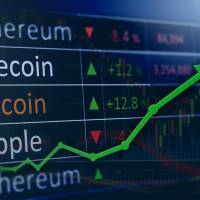 Companies such as bitFlyer and Coincheck are working on increasing the number of companies enabling the use of cryptocurrency for transactions. For example, Bic Camera Inc., the operator of a chain of stores selling various electronics, in July began accepting BTC at every outlet in Japan, with support from bitFlyer. In Shibuya, the pop culture center of Tokyo, NEM Bar opened in December, where NEM, or otherwise known as XEM, and BTC can be used to buy cryptocurrency-themed cocktails and other drinks. XEM is also a type of cryptocurrency. Coincheck has started a service to pay electricity bills in BTC in collaboration with E-net Systems Co., an electricity supplier. Global cryptocurrency exchanges are working to spread the use of cryptocurrencies with various companies, and adoptions by companies such as Amazon.com and Airbnb.com would “make a big difference,” Kanemitsu and Yoshisuji agreed. However, some people caution that the prices of cryptocurrencies must be stable for people to use them for regular purchases. “Nobody would want to use (cryptocurrencies) as money when their prices are expected to go up,” said Kenji Saito, a senior researcher at Keio University’s Keio Research Institute. Cryptocurrencies’ core technology is based on blockchain, which enables verification of transactions via multiple connected computers. It enables multiple computers to store the transaction data, making it difficult to falsify data. It thus enables cryptocurrency management without central banks or other authorities. Saito, who is also the representative director of Beyond Blockchain and the chief science officer of BlockchainHub Inc., said blockchain is not a perfect technology and his research team is building a new platform named Beyond Blockchain One (BBc-1). “We aim (for BBc-1) to be closer to perfection than blockchain,” he said. As many programmers work to come up with better-than-existing technologies, while improving existing technologies, many believe technological innovation will make cryptocurrency closer to perfection. “Cryptocurrencies are a world-changing technology. While people today may have an image of them being a speculative investment, we hope many people will invest in them under manageable risk,” Kanemitsu said.